The drawing at the left is of an Inuit blanket tossing game. 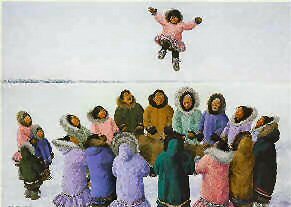 It is a game often played at festivals and other Inuit celebrations and reminds one of non-Inuit contests which make use of a trampoline. This sketch is by Sorosilutoo and is titled Qumuaqataijut. This Inuit artist is from Cape Dorset on Baffin Island (Government of Canada: Ministry of Indian & Northern Affairs, 1975, #QS-8050-000-BB-A1). © Francis. Lower graphic courtesy of Canadian Art Prints, Inc.